An avocado tree (Persea americana) can reach 80 feet tall with 4- to 8-inch glossy evergreen leaves, but usually stays shorter and grows in U.S. Department of Agriculture plant hardiness zones 9 through 11. 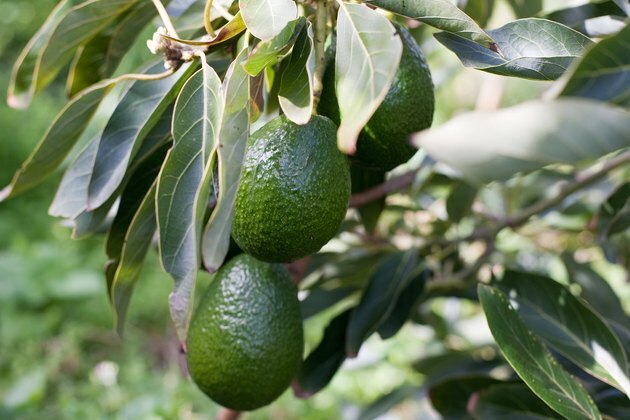 Clusters of small green flowers appear in its leaf axels from January through March, and these should be followed by 3- to 6-inch bumpy avocados. But avocado trees may not produce fruit for a number of reasons, including being too young, not being pollinated fully and poor weather. Mature avocados are green or black, depending on the variety. Grafted trees can fruit in their first year, but avocados started from seed often won't fruit until they are 8 to 20 years old. If your tree is a seedling, you may simply have to wait until it matures. Although avocado blossoms contain both stamens and stigmas, they aren't self-pollinating. When a tree's blossoms first open for a two- to three-hour period, they are female stage flowers, meaning the stigmas are ready but the pollen isn't. The following day, they open for several hours as male stage blossoms, with plenty of pollen but stigmas no longer able to receive it. A-type avocados, such as "Haas" -- perennial in USDA zones 9 through 10 -- are female one morning and male the following afternoon. B-types like "Fuerte," which grows in the same zones, are female one afternoon and male the following morning. Because the flowers open over a period of several days, it is possible for bees to carry pollen from A-type stamens to B-type stigmas one day and from B-type stamens to A-type stigmas the next. To ensure proper pollination of your avocado tree, make sure you have at least one tree of the opposite type as well. Even if you do have the correct types of trees to provide proper pollination, freezing weather during their blossom time can kill the buds. Low temperatures during that period -- below 63 degrees Fahrenheit -- may shorten the already brief female stages in the flowers and cause pollinating bees to stay in their hives. Heavy rains can also discourage bees not to mention that they often prefer to flit from blossom to blossom of the same tree instead of flying between two different trees. 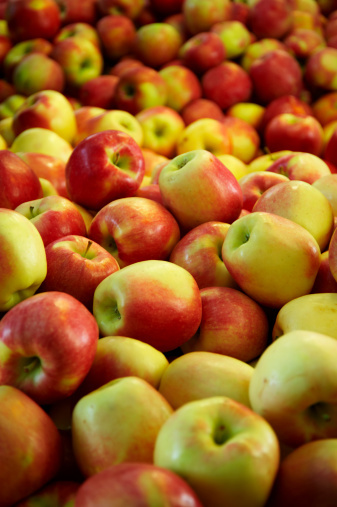 To prevent weather-related problems, only grow trees that are hardy in your zone, and pollinate the flowers yourself. You can use an artist's paintbrush to carry pollen from the stamens of whichever tree is in the male stage at the time to the stigmas on the female stage one. Hand pollination can make an avocado tree set 23 times as much fruit as it would have if the pollination were left to insects. When an otherwise healthy avocado repeatedly refuses to bloom although it is at fruit-bearing age, consider scoring the trunk. This is a risky measure and should only be done after you have tried everything else, as it could endanger the life of the tree. To score a tree, use a sharp penknife to make a shallow horizontal cut through the bark, low on the trunk and extending only halfway around it. Then draw another such cut on the opposite side of the tree but several inches farther up than the first one. Don't attempt to connect the two cuts -- or to draw a line completely around the trunk -- because that will kill the tree. Carefully wipe the blade with a cloth soaked in rubbing alcohol before you use it to prevent the spread of disease. What Is the Difference Between a Male & Female Avocado Plant?